Aborted. Press any key to exit. error: you need to load the kernel first. A new grub version was published on 2017-07-28 in 2.02~beta2-36ubuntu3.12. This seems like it could be a regression in grub that 2.02~beta2-36ubuntu3.13 (currently in proposed) could probably fix. I'm still getting this. 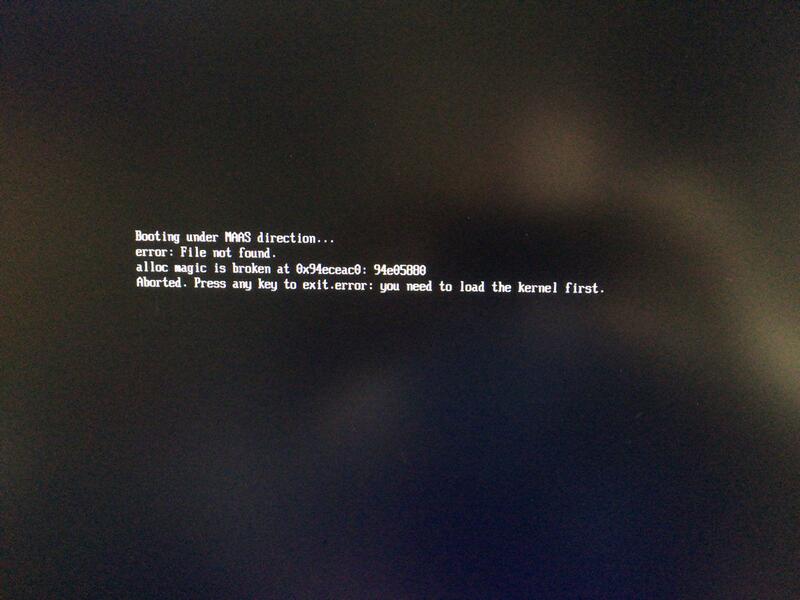 I tried updating the NUC firmware where this repeats, no joy. Maas version: MAAS version: 2.2.2 (6099-g8751f91-0ubuntu1~16.04.1). My images are all "synced" as of today. This led me to think there was an error with the kernel selected for the ephemeral boot, so, I went into settings, 16.04 was selected, but the kernel was 'no minimum kernel'. I changed that to 16.04-hwe. I then was able to enlist. After that, I switched it back to 'no minimum kernel', and it still enlists fine. I suspect some kind of migration is amiss, and it was trying to tell the node to use a kernel that was no longer there, or not referenced in the right way. Anyway, appears working now with that workaround.